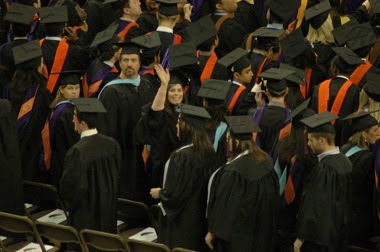 I received my Masters degree from Clemson in 2010. I remember as an undergrad I didn’t care to walk the stage. It seemed a boring task for me. But I was first generation in my family to graduate from college and it was important for my parents to see me walk. With my Masters, it was different. I’m more mature now and I really put 110% into the program. I worked hard for two years, sacrificing many things, including my family, to graduate with a 3.88 out of 4.00. (dang statistics ruining my 4.0!!) I wanted to walk. I wanted to walk for quite a few reasons. 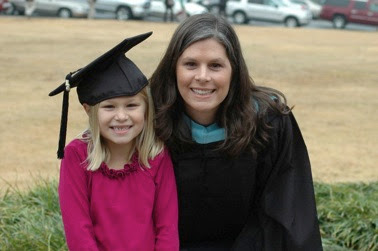 I wanted my daughter to see me walk across the stage. She was about two weeks shy of seven when I graduated. I wanted the image planted in her head. She knew the amount of work I put into school. There were many nights she cried asking me to put the computer down and read to her. The 20-page paper was due the next day, I couldn’t put the computer down. There were many nights I cried thinking I took on too much, I couldn’t possibly be successful. There were many fights with my husband as he had to pick up the slack while I did school work. I wanted her to see how the hard work paid off. I wanted her to have a feeling of pride as she watched her mother cross the stage. I wanted her to recognize the importance of education and life-long learning. I was part of an online graduate program. My classmates and I had the opportunity to meet on campus twice throughout the program. I am still amazed at the mutual respect and collaboration built over the two years of the program. I made very good friends that are still a part of my life. We all worked so hard and while not all of us could make the December graduation, for those of us that did, it was an amazing experience. We worked really hard as a team and to share the moment with them was invaluable. It was important for us to be together and walk. I’ve been asked numerous times how it feels to be a graduate. I’ve thought about it many times starting when I presented my Masters Research Project and received such positive feedback from my committee. That is when it hit me - I did it. I made it. I was going to graduate. I can’t really explain how it feels to be a graduate. I try to put into words how I feel. I can’t find the words. Suddenly, I am quiet. I’m sitting in the middle of Littlejohn Coliseum. There are hundreds of students with black gowns and graduation caps on. I’m thinking about my life since I left Clemson 13 years earlier. I made a promise to myself at graduation in December 1997: I would get a Masters degree. I wanted a goal for myself. I wanted to know I could do it. I wanted to know I was smart enough. I started graduate school at USC straight out of undergrad. I didn’t really know what to do so why not? But the problem with starting graduate school with no real plan is it becomes a huge liability on your time and wallet. And, let’s face it, for someone whose blood runs orange, it was hard to imagine myself with a degree from USC. So, I stopped school and went on with my life. Always searching for the one program that would be the right one. I made the decision to leave my career at the top of my game. I had exceeded and maybe even shattered everyone’s expectations of what I could accomplish at the company. I made the decision because the career, while completely amazing and fun, took me away from home on a regular basis and my baby was suffering. 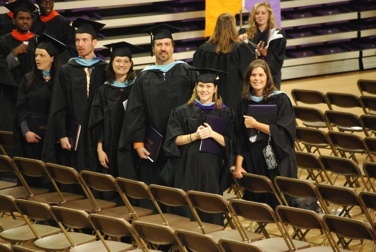 It was during this time I found my graduate program. It was a perfect fit. I was very interested in the curriculum, it was family friendly, and it was through Clemson. Finally, 10 years after quitting graduate school, I began a new graduate program with a purpose and a plan. Here I sit, in the middle of the Coliseum, looking around me. While Clemson still has many of the great things I fell in love with, there is a shift on the campus. Classes are taught differently (for the better). There are new buildings on campus. The cafeteria food is actually good. Technology is an integral part of teaching. Collaboration and partnership are the norm. Ice cream is no longer served in Newman Hall. 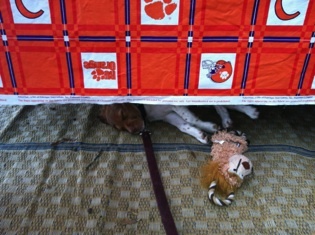 Dusty, our dog, at his first tailgate - he was so tired from playing with all the kids! At the same time, things are the same. Mac’s still has the best burgers in town. Bowman Field still fills with students on warm, Spring days. Judge Keller’s still has the distinct smell of a longtime downtown store. And, when I turn on Perimeter Road and pass Death Valley, I still get chills. I hear the crowd. I see the Hill. I feel the excitement. So, while many things seem different, the core is still here. Clemson is a family. I became a part of the family 13 years ago, and now, I feel even more pride. I feel an even closer connection to my Tigers. My excitement is boiling over. The realization that not only did I do it,I did it well. I look through the crowd till I find my parents. Then I spot Ashton and Franklin. It has come full circle. My little girl is in the crowd jumping up and down, waving to me. She sees me. She sees me. She sees me. It hits me. Every feeling I have right at this minute (pride, accomplishment, relief, etc), is nothing compared to the pride I see in her face looking at me. She is proud of me. What does it feel like to be a graduate? I made a significant, positive impact on my daughter and it feels great! Guest post written by Karen Bunch Franklin. Bio: Karen Bunch Franklin is originally from Summerville, SC and currently lives in Lexington, SC. 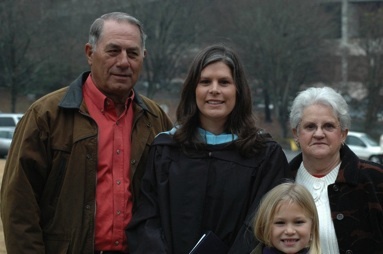 She holds two degrees from Clemson and is currently pursuing a second Masters Degree at Clemson in Agriculture Education. 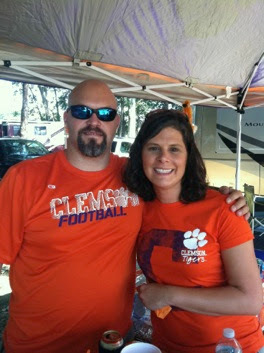 She is married to Kevin Franklin, whom she met while attending Clemson as an undergrad. They have one daughter, Ashton, whose blood runs ORANGE! The family puppy is also a Clemson fan and attended his first tailgate last football season. 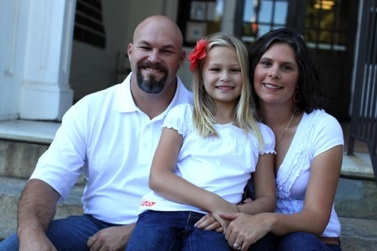 She currently works for Clemson University in the Expanded Food and Nutrition Education Program (EFNEP). When not working or studying, Karen enjoys boating, camping, reading (for fun! ), and all CLEMSON sports! !